Happy National Bacon Day!! Woot woot! Can you tell I am excited? I can't help it. I mean, a day set aside for us all to worship enjoy all things bacon? Yes please sign me up SIR! Of course it is not like I abstain from bacon the rest of the year, holy crap I don't even want to think about that! But there is something about an official holiday that brings out extra excitement to celebrate right? Heck, I am always game for a good party, and I don't even care if it is BYOB (bring your own bacon.....ya that was weak I know). I will tell you though that, at my house, there is no need to bring your own bacon because I have had pounds (which is slightly more than usual) of that fabulous meat candy flowing through my kitchen! I knew I wanted to come up with something awesome for the big day. Leading up to it I have had a couple notable dishes with bacon. Two of my favorites were BLT Potato Salad, and my Crab Puppies. The BLT potato salad was a perfect side for all of our BBQing that has been going on around here. It is creamy with caramelized leeks, roasted tomatoes, and studded with crispy bacon. It doesn't get much better than that folks! Then there were those wonderful little Crab Puppies *sigh* chock full of sweet lump crab, green onions, crispy bacon, all brought together with beer. Be still my heart! I am seriously swooning right now folks, someone might need to catch me if I fall!! So the humble little hot dog is what has been calling my name. It just seemed fitting to me that I take my craving and mash it up with a classic bacon dish, the BLT. But let's bump it up just a tad shall we? We won't grill that little doggie. Ohhh no no my friends, that wouldn't be any fun at all. Plus we are trying to celebrate bacon, and for that you can't just just slap some bacon on a dog and call it a party can you? Nope, I think not. Buuuutttttt if you cook that said dog in the bacon fat? Well that just takes it to a whole other level of drool worthiness, can I get an amen people? What is the verdict when it comes to this delectable canine creation? Dig ding ding....we have a winnaaaaa!! We sucked them down so fast there was barely time for a positive ID check! Cook the bacon over medium heat until crisp. Remove, with a slotted spoon, to a paper towel and return the skillet back to the heat. Place the hot dogs in the skillet with the bacon grease and cook until seared and browning on all sides. Slather one side of the hot dog buns with mayonnaise. Place a hot dog in each bun. Top with lettuce, tomato, and bacon. I've been hankering for a hot dog. These looks DIVINE!! Ahh a fellow hot dog craver!! Yes yes, give these a try, simple but sooo good!! Also, if you wait until tomorrow, I will have a mayo in that recipe that would be fabulous on this dog! I didn't know it was National Bacon Day but I had a BLT. It must have come to me through the ether. 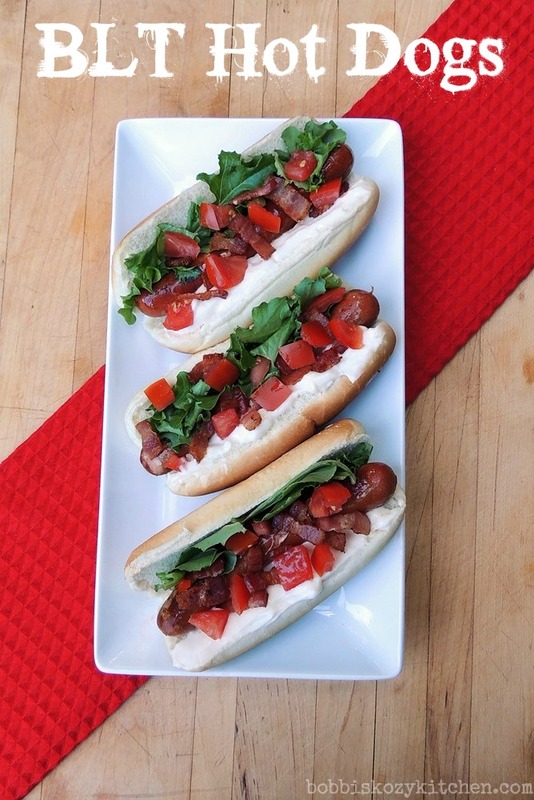 I should have made these outstanding BLT hot dogs. Don't they look good! You were psychic :) I hope you do give these guys a try though! !